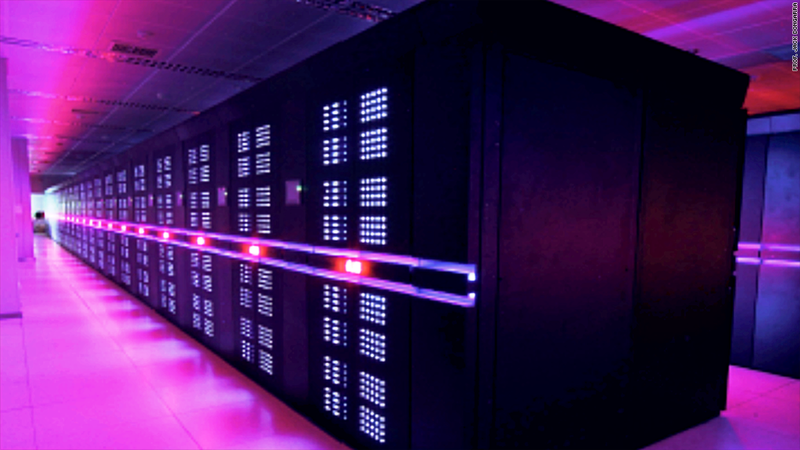 The Tianhe-2 supercomputer from China is slated to become the fastest in the world. The new Tianhe-2 supercomputer, nicknamed the Milkyway-2, was unveiled by China's National University of Defense Technology (NUDT) during a conference held in late May. University of Tennessee professor Jack Dongarra confirmed this week that the Milkyway-2 operates as fast as 30.7 petaflops -- quadrillions of calculations -- per second. Titan, the U.S. Department of Energy's fastest supercomputer, has been clocked in at "just" 17.6 petaflops per second. Dongarra is also a researcher at the Oak Ridge National Laboratory which houses Titan. The new Chinese supercomputer will provide an open, high-performance computing service for southwest China when it moves to the Chinese National Supercomputer Center in Guangzhou by the end of this year. NUDT has listed several possible uses for the Milkway-2, including simulations for testing airplanes, processing "big data," and aiding in government security. The Milkyway-2 will have to be officially tested, but its incredible speed will likely place it atop the biannual Top 500 supercomputer list, which is expected to be unveiled during the International Supercomputing Conference next weekend. It would mark the first time since 2010 that China topped the list -- then with the Tianhe-1. The rankings earn more than bragging rights as supercomputers become increasingly important to national security. The Titan aids in American research about climate change, biofuels and nuclear energy. In May, a U.S. House subcommittee held a hearing on supercomputers where researches asked Congress to provide funding for "exascale" computers, which could operate at one quintillion flops per second. "Perhaps this is a wake up call," he said.